I've always believed that happiness is self-created. You can be in the most stressful job, the hardest major, or in a difficult phase of life and still be happy. 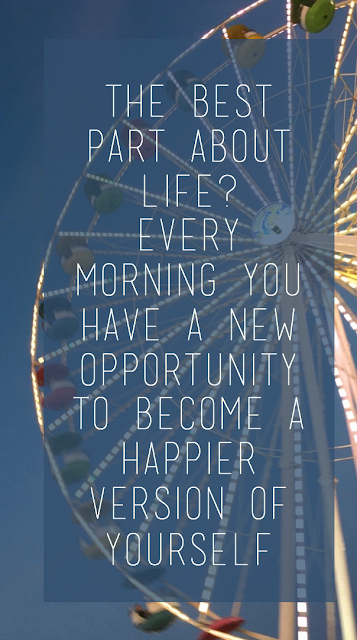 Because happiness lies solely in your decision to be happy and live a life you love, I know easier said than done. But the key to living a happy life is through your attitude. If you approach everything with a positive attitude then you will live a better life. It seems simple but it really does make a difference because your attitude shines through in everything that you do. I try to live my life with this attitude. I fell down the stairs in front of the dining hall for everyone to see, I laughed it off. I didn't do as well as I wanted to on a test, I'll study harder next time. Something didn't work out for me, something better will come along. There is no reason to get bogged down in the negative, to get caught up in things you can't change. Embrace them, make the best out of them and move on. And know things can only get better. Here's what you can do: smile more, stop talking down to yourself, reach out to people, devote yourself to doing good. It's about creating an aura of positive and happy around yourself and that makes all the difference. Surround yourself with people that radiate the same positive energy because nothing will make you feel happier than surrounding yourself with people doing the same. School, work, life it all bogs you down. But the truth is that even though those things take up so much of your time, they aren't the point of life. The point of life is to live, to love, to enjoy. So take time and go on that vacation you've been dreaming of. Buy those shoes that make you feel like a million bucks. Spend time with the people that make you laugh and smile. Because even if you are the top person at work, even if you get that 4.0, your life lacks so much without those connections and moments. They are the things in life that make it truly worth living. BeLife is constantly changing and living with a positive attitude makes all the difference. Create a life you love and I bet that starts with finding your happy.